Generator covers should be considered an essential tool for anyone who owns a generator. For some it may seem trivial but when you cut down to brass tacks, it is better to be prepared and safe than looking the fool without a working generator. In the everyday hustle and bustle of life, things can go wrong. You want to be sure you have prepared yourself for all situations and created safeguards. But wait, not any cover will just do. You need to carefully pick the right one that suits various situations. Don’t just go into this with the mindset of “Oh, any cover will do, what is the difference, right? With this guide, you’ll get to see some of the best overall generator covers available Whilst there can be differences in the styles, types and capabilities of some of the generator covers, there will certainly be a choice that is right for you. Similar to what has been said previously, there is more to generator covers than just “Pick one, throw it over the generator”. Consideration must be taken to how you will be using the generator and for what purpose. Why is this important you ask? These covers are created with intended purposes to suit how you operate your generator. They come in 2 basic types: Operational and Storage. Operational Covers are built with the intended purpose of use when the generator is active and in use, directly feeding electricity and power to the residence or item in need. One downside however is that these covers do not actively cover the entire body of the generator. Why is this you ask? When a generator is in use it obviously intakes petrol and other chemicals to fuel its usage. Understandably, this creates a high amount of emissions as a result and as with all devices that create emissions, appropriate ventilation needs to be provided. Covering of these emissions inside an enclosed generator cover can have major impacts on the sustainability of the device, causing overheating, ventilation issues and damage to internal wiring and components from the noxious fumes. Storage Covers accompany a stationary and dormant generator, simply there to protect it from the elements as well as ensure that the useful life of the device is kept in the utmost condition. Conversely to operational covers, storage covers can actively cover the entire body of the generator but with the drawback of inoperability whilst being covered. You would want to consider a storage cover for situations where the generator is used sparingly and not in operation for a long period of time but left as a failsafe should any harm befall your residence, place of business or any location that is heavily reliant on the use of electricity. Once again, there is no clear indicator of which one is the best; it is all a matter of your intended use and actual use of the device. You could say that if the device is going to be constantly in use, an operational cover would be the most suitable choice. If your generator is merely a backup, then perhaps the storage cover would be a wise decision. Regardless of your choice of cover for your generator, there are clear advantages to having one for it. Wear and tear is a fact of life for many items that we use in our everyday, month, and year. Despite the fact that you might not be using the generator all the time, it can still be affected by various incidents, which will not only leave you with a damaged generator but also money out of your pocket. Improvement: There may be some cases when you purchase a generator that they provide you with a generator cover. This is an excellent first step towards providing maintenance of your generator (mentioned below) but there is still more to it. Consideration still must be taken towards how you are going to use your generator and for what purpose. Simply put, the acquisition of a new generator cover will help you in the long run as you decide on the terms of usage of your generator and obtain your cover with the specifications to suit. Safety: Ensuring the use of your generator is the main selling point of the generator cover and rightly so. These machines are comprised of multiple parts and operate to a somewhat complicated degree. For the everyday person, finding faults in a broken generator and fixing these faults accordingly can be a daunting, almost insurmountable task. Wind, weather, dust and other factors can cause long-term damage when a generator is left unprotected. These issues can accumulate and result in greater damage than you would expect. Weather and wind can wear down the important parts of the generator and necessitate the immediate removal and exchange of the aforementioned part. Dust, dirt, sand and other annoyances stirred up by the earth can become clogged in the ventilation ports, stuck inside tubes and cause the dramatic impact on the generator. As with all devices, you want to limit the possibility of problems happening. Maintenance: Whilst this advantage may be similar to safety, it warrants its own definition as an integral component of the advantages of generator covers. As you would expect with most items, they do not last forever. Parts wear down, perform unexpectedly or simply stop working. Generator covers cannot prevent this, but as a result of the added safety to the generator they also offer an overall improvement on the life of the generator itself. Would might cost a small fortune to fix on a broken generator could be easily mitigated by the use of a generator cover, which would minimise the effects of impending damage and save you money. In everything, things can go wrong, but with the generator cover you at least know that if something does go wrong you will have a strong form of protection and that fixing it will be much more manageable. For the most part, the advantages of generator covers remain consistent across the board when you are referring to either an operational or storage cover. Aside from the obvious differences in usage of the generator whilst covered, there can be differing effects of these advantages. Total coverage cannot be obtained when using an operational cover, but this issue and others are all negligible when it comes down to the underlying basis of having a generator cover. You are only disadvantaging yourself if you do not properly protect and maintain your generator. Created for the purpose of a storage/garden shed, the Suncast Horizontal Shed is also versatile enough to function as a generator enclosure. Builders who had thought of doing a DIY shed were the ones who discovered that it can be used a the main casing of their machine instead of crafting a shelter from scratch. They find that using this plastic shed is faster and easier, although not as cost-effective. Since there are a lot of setbacks in running a generator, such as not using it outdoors under the changing weather conditions and at the same time, not indoors where fumes can be inhaled, the use of a shelter may come in handy. Suncast’s resin plastic build is designed to face adverse weather such as rain, snow, wind, and heat. This containment is your best bet for running the generator safely outdoors where the fumes will not bother anyone, and at the same time protect it from the weather, curious animals, wandering pests, and preying thieves. Furthermore, the best thing about this shed is that it is easily customizable. If you find DIY generator shed tips online, you will find that most of them are using this brand of shed. It is because apart from the material, the design is big enough to house a generator and it sports two double doors in front and one top lid. This type of all-out exposure keeps the generator fumes out, while maintaining a source of ambient air. It is important that cool air comes to ease generator heat especially since it is prone to overheating when enclosed in a small tight place. At the same time, the doors and top lid are lockable so that your generator is tucked away safely. Take note, if you need to operate the generator while the doors and the lid are closed (i.e. bad weather or overnight operation), you need to install a motored exhaust fan and louver vents to ensure than fumes are pulled outside while fresh air is invited in. Never use your generator while the lids are closed. The Leisure Season Horizontal Storage Shed pretty much functions the same way as the Suncast horizontal shed, except this one is made of solid wood coming from the cypress tree family. As it functions the same way as its resin counterpart, people pick this one because it looks nice and wood is better heat conductor and noise minimizer. Although it won’t guarantee to lessen the noise even by just 50%, soundproof boards that may be attached to it better adheres to the wood material. As previously mentioned, this enclosure also complements a garden or a backyard that is filled with greeneries. Yes, this shed costs more than the plastic one, but the price is justifiable just by the look and finish of Leisure Season’s shed. It is also pretty roomy and can easily fit your generator and all the upgrades you may put. Another upside when using this as a generator cover is that you no longer have to purchase a wooden panel to be used for the generator’s foundation. Simply screw the generator in the middle of the enclosure so the vibration will not cause the machine to move. If you are using a plastic enclosure, you will need to put a wooden board to lie in between the base of the generator and the plastic floor. Because of too much heat emitted by a functioning unit, it might melt or permanently deform the plastic surface. As a generator shed installed outdoors, this containment features high-quality wood that is coated and finished with a protective base to make sure that it is moisture and weather-resistant, meaning, it won’t be affected by rain, snow, wind, or heat. Rodents and pests also detest the protective coating; no critters will be attracted to your generator. The doors also come with a provision for padlock. The storage shed is shipped with a guide to help you install it. Fret not, this shed can be easily installed and dismantled. Assembling it won’t take more than 30 minutes. The GenTent Wet Weather Canopy is the best of its kind in the market, not only because it is the only one of its kind designed to be portable yet able to function like a fully-covered generator cover, but also it works exactly how it promised. The fabric, made of marine grade vinyl coated polyester fabric that is manufactured in New England, has an operating range of -15 to 150 degrees Fahrenheit and is fully weatherproof. Creators of GenTent constantly innovated the product through careful consideration, prototyping and testing; resulting to a foolproof design to ensure that it is ready to take on heavy downpours, snowstorms, hail, ice and freezing rain. It has also been under the strain of high winds and beating sunshine, yet kept the generator working at its finest. GenTent ships with an electrical skirt to protect the electrical outlets from water or humidity, which allows the generator to be used safely in wet weather conditions. At first glance, you will wonder how this small generator cover manages to take on extreme weather conditions. It only covers the upper part of the generator and keeps the bottom open. Why? Because GenTent is designed to cover a working generator, it should not hinder exhaust emission and at the same time allow cool air to keep the generator from overheating. An overheated generator will not last long. Extreme situations may also result if it is left to run around its own exhaust gases. If you wish to fully cover the generator (for storage), you have to purchase an accessory, called the GenSkirt, which covers the entire generator. 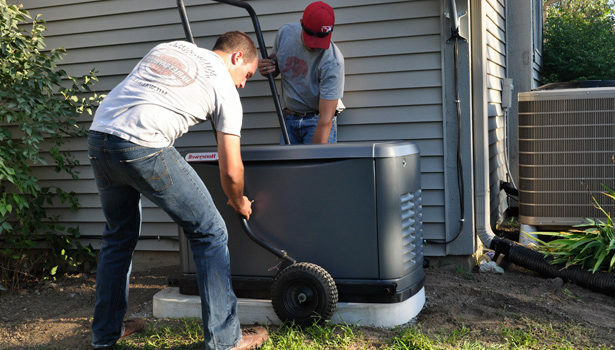 Since it goes great extents in protecting your generator, you might think that it takes some time and effort to actually set it up. Surprisingly though, the tent only requires a simple three-step installation: clamp, frame, and cover. There are no tools necessary; all you need to do is follow the instructions in the installation manual. If you like portability, you’ll be glad to know that GenTent only takes about 5 minutes of your time. ShelterLogic Shed is basically a multi-purpose tent. Small enough to house machines such as a generator, yet big enough to contain other items and materials for storage. It is open, but features a wide door that can be rolled up to make sure that ambient air may come in to cool an operational generator. The fabric is made up of triple layered chemically heat bonded enhanced weave, rip stop, waterproof, polyethylene cover. It is UV treated inside and out with added fade blockers, anti aging, and anti fungal agents, guaranteed to withstand the adverse changing weathers. It can be easily mounted because of the smooth poles that easily slip inside the flaps of the tent. The poles are made from high-grade steel, baked on powder coated finish prevents chipping, peeling, rust and corrosion. Made with a white interior, it enhances illumination. Since it can house a running generator amidst any type of weather without blocking cool air, it is recommended as a cheaper alternative to the GenTent. It is also able to double as storage for backyard or garden tools, items, and equipment. Be warned however, not to put anything flammable inside the tent. The generator can heat up during operation and can stay heated for quite some time. The only downside of having this kind of tent is that it is not advisable to hold the generator in storage for long periods; it doesn’t give much protection from thieves while rodents can access it and damage the sensitive electric wires. Apart from that, it can perfectly enclose the generator from all other factors during operation, without also hindering carbon monoxide emissions. CoverMates is one of the generator covers in the market, which aims to protect the generator from dust, dirt, rodents, and hot and cool weather. This type of cover is only meant for storage and not for covering a running generator. Be careful not to attempt using it over an operational generator as it will not only cause the material to melt off because of the heat, it might also heat the generator too much and hinder the exhaust gases from coming out. It is made from stock-dyed polyester with the exteriors coated making it weatherproof. The interiors are lined with soft fabric to ensure that the finish of the generator would be kept at its best. Keeping it enclosed in a high-grade material protects the generator from corrosion, even if it has not been used for long periods of time. Rodents and pests will also detest the polyester cover, driving them away. The lightweight material also enhances breathability, which prevents mold and mildew. CoverMates generator cover comes with a elastic bottom and a draw cord to provide a tight, secure fit. This pocket-friendly cover promises to keep your unit clean and ready to go at all times. Spending a little bit of money now should be considered an insurance policy over your generator. Wouldn’t you rather pay a little bit to get an extra few years out of your generator rather than take the chance and risk having to shell out copious amounts of cash to fix that broken generator? All of it could have been avoided with one small purchase. Perhaps it would be best to consider buying both types of covers for the changing need and use of your generator, to ensure maximum efficiency. If you consider the need to be essential, a storage cover would be a great addition to the generator when it is not in use, changing to an operational cover if it is suddenly active and will be used for a significant amount of time. It is never too early or too late to make an investment in these generator covers to ensure that you will keep receiving power and electricity. With the options listed previously on the varying styles and types of generator covers, you should be well on your way to finding the best generator cover for your generator use. Tell your family, friends and other generator owners the benefits of having a generator cover as well. Not everyone will at first know that generators need covers and it is in their best interests to secure them for when they need them the most.